Butler point guard Ethan Morton (25) is surrounded by North Hills players during the Golden Tornado's 78-66 home win. Morton scored 35 points for Butler in the section opener. BUTLER TWP — North Hills made a couple of runs. Butler answered with bigger ones. The Golden Tornado (5-0, 1-0) remained unbeaten as a result, holding off the Indians (0-4, 0-1) for a 78-66 mutual boys basketball section opener in the Butler gym. Butler began the game by hitting 12 of its first 18 shots from the field, including seven 3-pointers, for a 32-12 lead with 7:11 left in the first half. North Hills steadily closed the gap from there, pulling within four points at 47-43 on a pair of Garret Barto free throws with 4:08 left in the third quarter. “We were playing at a quick pace. 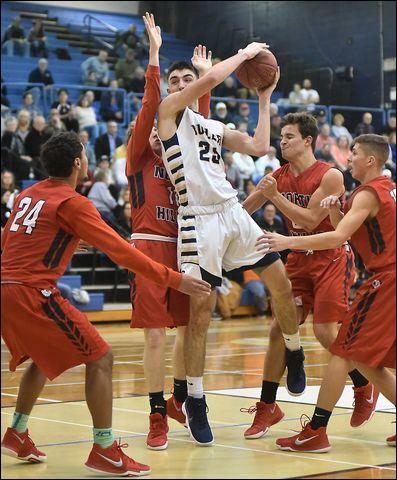 When you do that, you can give up a lot of points quickly, if that makes any sense,” Butler coach Matt Clement said. The Tornado went on a 12-0 run to stretch the lead back out to 16 at 59-43 late in the period. Mason Montag and Luke Patten came off the bench to put back offensive rebounds during the run. Again, the Indians fought back. A 3-pointer by Kameron Taylor — who led all scorers with 29 points — pulled North Hills within 64-60 with 4;44 left to play. Butler freshman Mattix Clement answered with his second of three fourth-quarter treys. Morton tallied 35 points, eight rebounds and five assists on the night. Patten had 11 points and five rebounds, Tarik Taoufik 10 points and six boards, Luke Michalek seven points, nine rebounds and seven assists. “When Luke Patten gets points, it's like a bonus because of everything else he does on the floor,” Coach Clement said. “That kid is only a sophomore and he's gonna score a lot of points at this school. Morton was 12 of 14 from the foul line and the Tornado sank 17 of 19 free throws. Morton said he didn't try to take the game over after North Hills made its two runs. “I just let the game come to me,” he said. “If other guys are open, I'm getting them the ball for open looks. That's how we're gonna win. “For Mattix to do what he did, sink three treys, all at critical times as a freshman ... That was special. That's something I never did last year. “Luke Patten gives us so much when he's in the game. He gets the big rebounds, plays good defense. He's definitely a big reason why we won this game,” Morton added. Barto had 20 points, 14 rebounds and three steals for North Hills. John Albright had 10 points, Alex Brown five assists and five rebounds. “We competed tonight and that was the big thing for us,” Gabos said. “Butler hit 11 three's tonight on those kick-outs after penetration. Mattix Clement took four shots from out there and hit three of them. Butler has yet to trail on the scoreboard at any point in a game this season. The Tornado head to Shaler Tuesday night. Alex Brown 1-6 0-0 3, Jordan Albright 4-12 1-1 10, Joe Ryan 1-1 1-2 4, Kameron Taylor 11-22 4-8 29, Garret Barto 8-13 4-4 20, Daniel Ritchey 0-2 0-0 0, Alex Glatz 0-0 0-0 0, Wyatt Mays 0-0 0-0 0, Tyler Brennan 0-1 0-0 0. Totals: 25-57 10-15 66. Luke Michalek 3-9 0-0 7, John Michalek 1-3 0-0 3, Mattix Clement 3-4 0-0 9, Tarik Taoufik 3-9 4-5 10, Luke Patten 4-7 0-0 11, Mason Montag 1-3 0-0 2, Ethan Morton 10-21 12-14 35, Dom Schmidt 0-0 0-0 0, Isaiah Scribner 0-1 0-0 0, Nick Stazer 0-1 0-0 0, Kevin King 0-0 1-2 1 . Totals: 25-60 17-19 78.